Definition at line 42 of file lldrawpoolwater.h. Definition at line 52 of file lldrawpoolwater.h. Definition at line 61 of file lldrawpoolwater.h. Definition at line 62 of file lldrawpoolwater.cpp. References LLViewerImageList::getImage(), LLControlGroup::getString(), gImageList, gMoonTextureID, gSunTextureID, gViewerArt, mHBTex, mWaterImagep, mWaterNormp, restoreGL(), TRUE, and WATER_TEST. 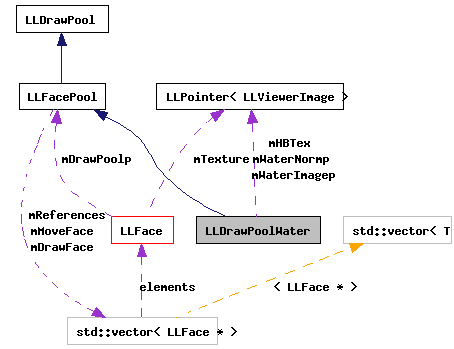 Definition at line 79 of file lldrawpoolwater.cpp. Definition at line 689 of file lldrawpoolwater.cpp. Definition at line 684 of file lldrawpoolwater.cpp. Definition at line 85 of file lldrawpoolwater.h. Definition at line 59 of file lldrawpoolwater.h. Definition at line 89 of file lldrawpoolwater.cpp. References llendl, llerrs, and NULL. Definition at line 96 of file lldrawpoolwater.cpp. References LLControlGroup::getBOOL(), LLShaderMgr::getVertexShaderLevel(), gFeatureManagerp, gGLManager, gSavedSettings, LLFeatureList::isFeatureAvailable(), LLGLManager::mHasCubeMap, LLDrawPool::mVertexShaderLevel, and LLShaderMgr::SHADER_ENVIRONMENT. Definition at line 105 of file lldrawpoolwater.cpp. References LLViewerCamera::cameraUnderWater(), LLPipeline::disableLights(), f, face, LLFastTimer::FTM_RENDER_WATER, gCamera, LLDrawable::getCurrentFrame(), LLMatrix4::getMat3(), LLViewerCamera::getModelview(), LLVOSky::getReflFace(), LLCoordFrame::getUpAxis(), gFrameTimeSeconds, gGLManager, glClear, glClientActiveTextureARB, glColor4fv, glDisable, glEnable, glLoadMatrixf, glStencilFunc, glTexGenfv, gPipeline, gSky, LLMatrix4::invert(), LLVOSky::isReflFace(), LLFacePool::mDrawFace, LLGLManager::mHasMultitexture, LLDrawPool::mIndicesDrawn, LLColor4::mV, LLDrawPool::mVertexShaderLevel, LLSky::mVOSkyp, mWaterImagep, renderReflection(), renderShaderSimple(), LLColor4::setVec(), shade(), SHADER_LEVEL_RIPPLE, stop_glerror, LLImageGL::unbindTexture(), and LLVector3::z_axis. Definition at line 674 of file lldrawpoolwater.cpp. Definition at line 667 of file lldrawpoolwater.cpp. Definition at line 466 of file lldrawpoolwater.cpp. References LLViewerImage::bindTexture(), face, LLVOSky::getDrawRefl(), gSky, mHBTex, LLDrawPool::mIndicesDrawn, and LLSky::mVOSkyp. Referenced by render(), and renderShaderSimple(). Definition at line 320 of file lldrawpoolwater.cpp. References LLGLSLShader::bind(), LLShaderMgr::BUMP_MAP, LLViewerCamera::cameraUnderWater(), LLShaderMgr::DIFFUSE_MAP, LLPipeline::disableLights(), LLGLSLShader::disableTexture(), LLGLSLShader::enableTexture(), LLShaderMgr::ENVIRONMENT_MAP, f, face, gCamera, LLMatrix4::getMat3(), LLViewerCamera::getModelview(), LLVOSky::getReflFace(), LLCoordFrame::getUpAxis(), gFrameTimeSeconds, gGLManager, glClear, glClientActiveTextureARB, glColor4fv, glDisable, glEnable, glLoadMatrixf, glStencilFunc, glTexGenfv, gPipeline, gSky, gWaterProgram, LLMatrix4::invert(), LLVOSky::isReflFace(), LLFacePool::mDrawFace, LLGLManager::mHasMultitexture, LLDrawPool::mIndicesDrawn, LLColor4::mV, LLSky::mVOSkyp, mWaterImagep, renderReflection(), S32, LLColor4::setVec(), stop_glerror, LLImageGL::unbindTexture(), and LLVector3::z_axis. Definition at line 84 of file lldrawpoolwater.cpp. Referenced by LLDrawPoolWater(), and LLViewerWindow::restoreGL(). Definition at line 500 of file lldrawpoolwater.cpp. References LLGLSLShader::bind(), LLCubeMap::bind(), LLPipeline::bindScreenToTexture(), LLShaderMgr::BUMP_MAP, LLViewerCamera::cameraUnderWater(), LLShaderMgr::DIFFUSE_MAP, LLGLSLShader::disableTexture(), LLGLSLShader::enableTexture(), LLShaderMgr::ENVIRONMENT_MAP, f, face, gCamera, LLFrameTimer::getElapsedSeconds(), LLSky::getMoonDirection(), LLCoordFrame::getOrigin(), LLSky::getSunDirection(), LLCoordFrame::getUpAxis(), glClientActiveTextureARB, glColor4fv, glEnable, glGetBooleanv, gPipeline, gSky, gWaterProgram, LLVOSky::isReflFace(), mask, LLFacePool::mDrawFace, LLDrawPool::mIndicesDrawn, LLPipeline::mScreenScale, LLGLSLShader::mUniform, LLColor4::mV, LLColor3::mV, LLVector2::mV, LLVector3::mV, LLSky::mVOSkyp, mWaterNormp, NIGHTTIME_ELEVATION_COS, LLColor3::normVec(), LLVector3::normVec(), S32, LLColor4::setVec(), sSkipScreenCopy, sTime, LLShaderMgr::WATER_EYEVEC, LLShaderMgr::WATER_FBSCALE, LLShaderMgr::WATER_LIGHT_DIR, LLShaderMgr::WATER_REFSCALE, LLShaderMgr::WATER_SCREENTEX, LLShaderMgr::WATER_SPECULAR, LLShaderMgr::WATER_SPECULAR_EXP, LLShaderMgr::WATER_TIME, LLShaderMgr::WATER_WAVE_DIR1, LLShaderMgr::WATER_WAVE_DIR2, and LLVector3::z_axis. Definition at line 45 of file lldrawpoolwater.h. Referenced by LLDrawPoolWater(), and renderReflection(). Definition at line 46 of file lldrawpoolwater.h. Referenced by LLDrawPoolWater(), render(), and renderShaderSimple(). Definition at line 47 of file lldrawpoolwater.h. Referenced by LLDrawPoolWater(), and shade(). Definition at line 49 of file lldrawpoolwater.h. Definition at line 51 of file lldrawpoolwater.h. Referenced by LLPipeline::generateReflectionMap(), LLPipeline::renderGeom(), and shade().